What are the different styles of massage? Is your body relaxed right now? So...unless you have just had a massage, are an extremely chilled out person, living on a cloud or in a deep sleep, the answer is probably...NO. Bring your awareness to your body. Are your shoulders trying to touch your ears? Did you just realise you're barely breathing? Are you clenching your teeth? Are you hunched over, twisted or contorted? Is your neck straining to hold your head upright? Are some of your muscles playing a game of tug-a-war? Are there any painful areas crying out for attention? If you answered yes to any, or all of the above, then it might be your body trying to tell you something. We can spend a lot of time in our heads, busy working, overthinking, stressing, worrying, future dreaming, past dwelling and getting caught up in what we are doing in the moment. When we are caught up in the mind, we can forget what the body is doing. This is when we need to check-in...not to the mental hospital, but check-in to our pysical bodies, to become consciously aware of the vessel in which our soul resides. 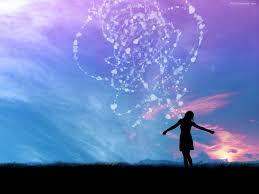 Close your eyes, focus on your breath, bring your attention back to your physical body. Notice if there are any tense, painful, or uncomfortable parts of your body that stand out? Focus on your breathing again. Take a few slow deep breaths, in through the nose and out through the mouth. Now bring your attention to one of the particular areas that has stood out to you. What does it feel like? Is it tight, weak, painful? Do you need to reposition yourself or stretch out so it feels more comfortable? Try to relax the muscles in that region. Imagine with each breath, you are breathing in new energy and vitality and breathing out tension, pain, stagnant energy or stored emotions from that area. Do this for as long as you want and then move on to other parts of the body that need attention. Once you've addressed all areas, ask your body if there is anything it needs right now. This is an internal conversation so don't worry, people won't think you're crazy...unless you start verbally arguing with yourself or talking out loud to your hand puppet! Take a moment to listen to what your body is trying to tell you. It may be a silent whisper or a loud voice in your head. Let your imagination flow. For what is imagination but the bridge between two worlds and the answers that arise may just surprise you. 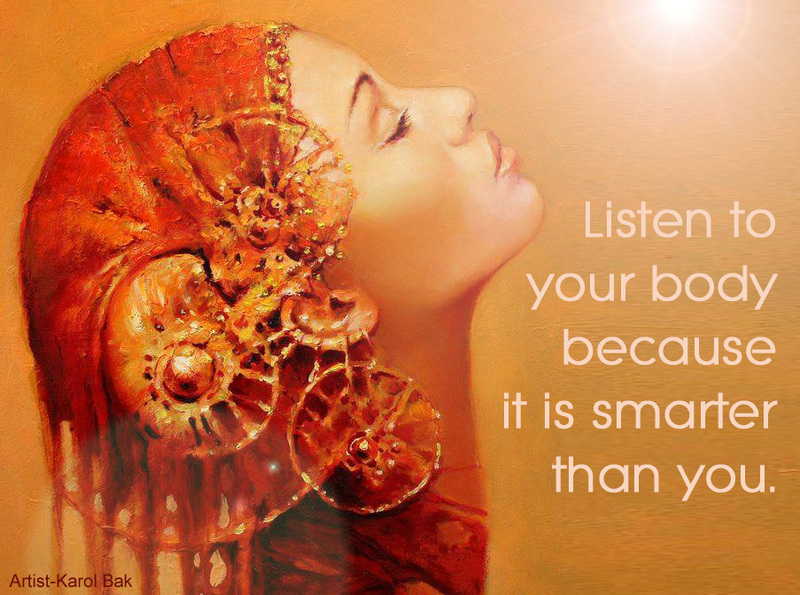 Listen to your body because it is smarter than you! Treats a wide range of disorders including; back or neck pain, headaches, soft tissue injuries, sciatica, arthritis, carpel tunnel, hypertension, chronic pain, depression, Insomnia…. Put yourself first. You can't be anyone else unless you take care of yourself. Express your opinions. It's good to hear yourself talk. When you feel like running away, let yourself feel the scare. Think about what you fear will happen and decide what you need to do. When you're hurt, tell the person who hurt you. Keeping it inside makes it grow. When you have work to do and you don't want to do it, decide what really needs to be done and what can wait. When you want something else, ask. You'll be OK if they say no. Asking is being true to yourself. Trust yourself. You know what you want and need. Let your feelings be known. They are important. Take the time and space you need, even if other people are wanting something from you. When you're angry, let yourself feel the anger. Decide what you want to do, just feel it, express it, or take some action. When you see someone else's hurt face, breathe. You are not responsible for making other people happy. When you feel alone, know there are people that want to be with you. Visualise what it would be like to be with each of them. Decide if you want to make that happen. When you need something, don't talk yourself out of it. Even if you can't have it, it's OK to need. Value your thinking, you do it well. When you're scared let someone know. Isolating yourself when you're scared makes it worse. When you're sad, think about what would be comforting. When you have tears, cry. When people turn you down, it usually has to do with them and not with you. Ask someone else for what you need. Take a few more deep breaths, making sure your body is more relaxed. You may think this is too easy, and you’re right. Too easy! Your body and your mind have now become happier places to be.